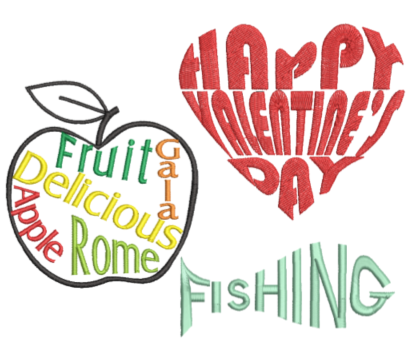 Month 1: Words in Shapes - Begin the year learning more about CorelDRAW SE. Conform lettering to outline shapes to form a collage of words tht can be embroidered or painted with DesignWorks. Month 2: Playing with Patterns - Get creative with the patterns in BERNNA Embriodery Software. Even create your own patterns and send them to the machine for embroidery or for stitching. Use pattern fills, pattern outlines, and pattern stamps for embellishment! Month 3: Intertwined Designs - Explore CorelDraw SE and learn how to create an intertwined, wrapped design to add dimension to your projects. Month 4: Heirloom Touches - Using tools in BERNINA Embroidery Software, create touches of heirloom embroidery to add to your projects. Month 5: Creating with the Blend Tool - The Blend tool in CorelDRAW SE gives you many creative embroidery options to add to your quilts, clothing, and craft projects. Month 6: Lettering Play - Explore creative ways to play with fonts.